BAZ Luhrmann’s 2013 adaptation of F Scott Fitzgerald’s novel THE GREAT GATSBY portrays a journey of self-discovery through the main character Jay Gatsby (Leonardo DiCaprio). The story is told through the narrator Nick Carraway (Tobey Maguire) recalling the summer of 1922 when he moved to New York, specifically West Egg, neighbouring Gatsby’s mansion. He tells the story of how he met Gatsby and his opinions of him and his life. Set in America during the Roaring Twenties, the hedonistic, excessive nature of the era is presented in Gatsby’s mansion. Large chandeliers, live bands and a privately-owned beach only highlight Gatsby’s wealth, which is the result of years of reinventing himself after he wanted a better life. Originally given the name James Gatz by his farming parents, he decides to leave and create the life he wished he always had. 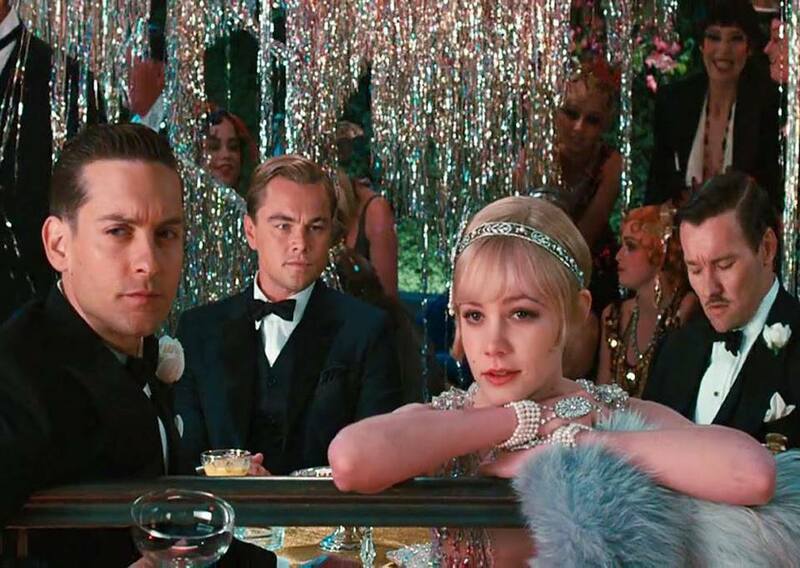 After meeting millionaire Dan Cody (Steve Bisley) and falling in love with Society girl Daisy Buchanan (Carey Mulligan), Gatsby decides to spend his life trying to become everything she represents: wealth and class. He changes his name to Jay Gatsby in an attempt to leave his past behind and pursue happiness. The story is ultimately one of rags to riches; a man who makes something out of nothing. From then on, he joins the Army and became an officer based in Louisville during World War One. After his experience within the Army, Gatsby becomes involved in organised crime in order to build his wealth and status so he can live comfortably in West Egg. This shows Gatsby's resilience to achieve his dream of a new life, even if it begins to question his moral compass. Nick’s first experience of a party thrown by Gatsby highlights the fact that nobody knows who he is or where Jay has come from after moving to West Egg, ultimately though, nobody seems to care. There is speculation over whether he is a German spy or whether he has killed a man. The ambiguity surrounding his character only reinforces Gatsby’s complete reinvention of himself. His journey to become wealthy seems successful as only a few question him, preferring to indulge in the copious amounts of alcohol he supplies. Nick and Gatsby’s lives are contrasted to show the sheer extent of how far Gatsby has gone in order to complete his journey of becoming wealthy. Nick is content with his small cottage, whereas Gatsby has a pool, his own library and hires waiters and servants to clean up after his parties. Gatsby’s character is shown to value material goods as they represent success and wealth and he proudly flaunts his material possessions as a reminder of how far he has come. ​THE GREAT GATSBY portrays Gatsby’s journey of self-discovery as being triumphant as he achieves his dream of gaining a completely different life, even though most of this success was accomplished by less than moral means. The title of the film emphasises Gatsby’s journey to reinvent himself as worthy of his “great” status. However, with it poses the question: does he ever attain the elusive “happiness” he was originally searching for?